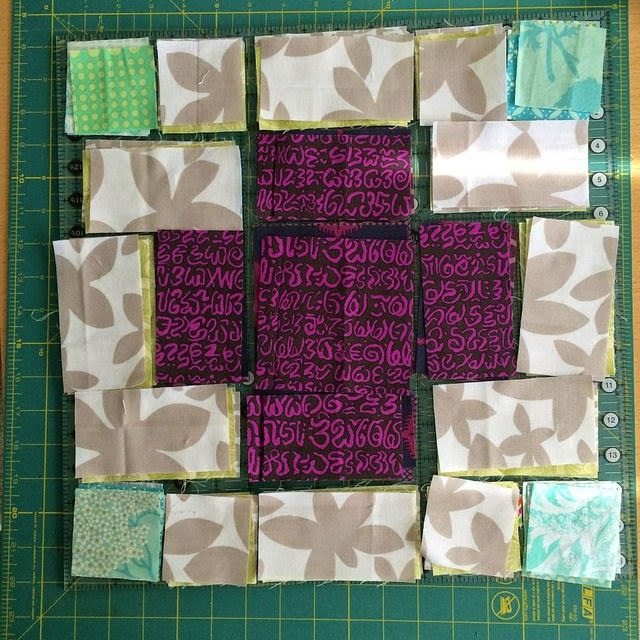 Creating virtual quilts won't use up my stash but I'm pretty sure it'll spark a creative frenzy that makes me want to sew! About six months ago I joined the Facebook group QDAD created by my friend Anne@ PlayCrafts . Until today I'd been a lurker member (which is actually allowed in this no rules group). 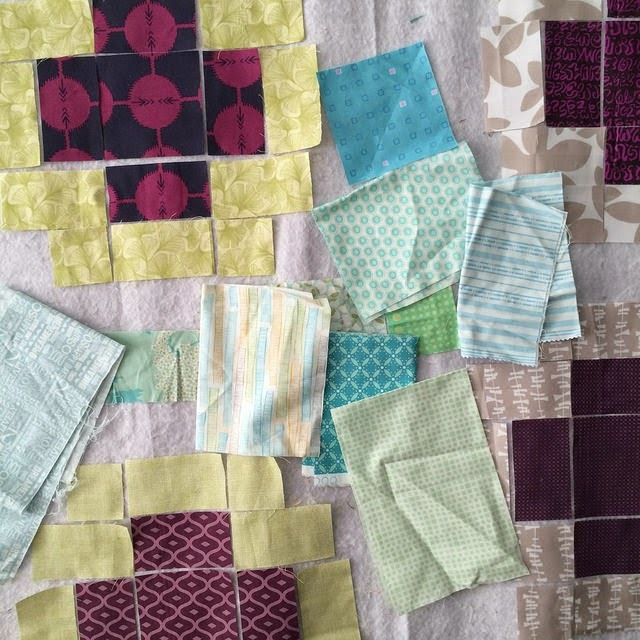 I've got 15-30 minutes a day to spare (especially if I don't play candy crush on my phone) and I've been wanting to make my own quilt designs and join the fun - but had been letting the lack of tools stop me (although I do own crayons/pencils & paper). After listening to Anne's MQG webinar on Wednesday night, I decided to stop making excuses and give the free software inkscape a try. The learning curve is huge but that's not stopping me either. 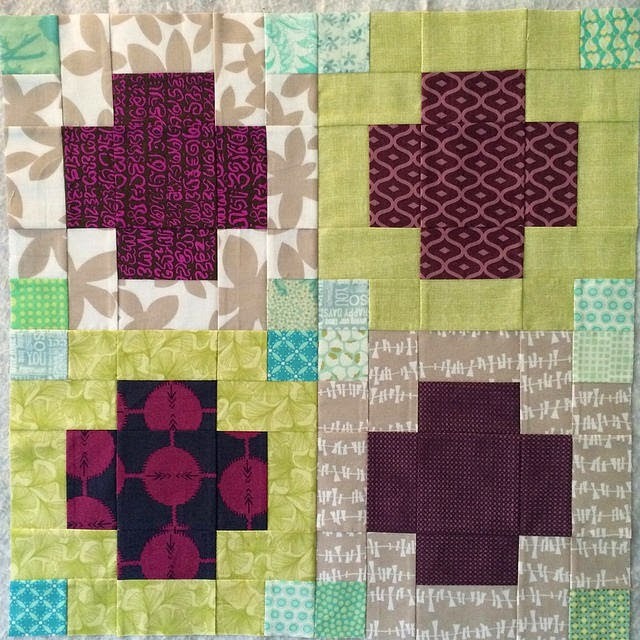 Day one of the "Getting Started" challenge was a nine-patch so I made one that I like pretty well. I wanted to see what happens with a repeat and rotate of the block so I dumped it into word as an image and took a screen shot picture. Once I get my head wrapped around the program I won't have to resort to such ridiculous methods. 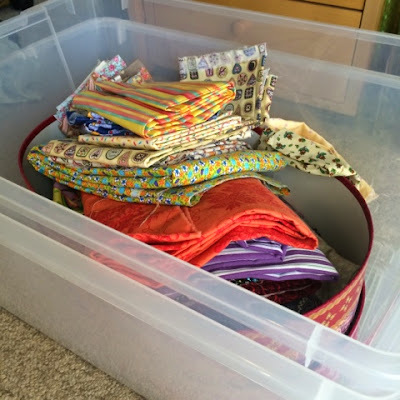 I've already done some major purging of fabric that I'm no longer in love with or simply felt would better suited to someone with more time to make projects from it than me. Despite the trunk load of my stash that I passed along for pennies on the dollar at the yard sale and the remaining that I donate to my local guild, there is no shortage of fabric around these parts. 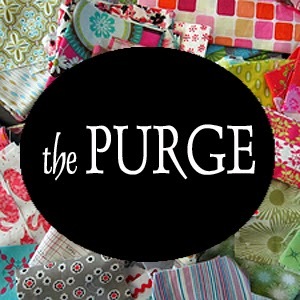 Linking up to Stitched in Color for The Purge. She's put together really great ideas about how to deal - and a support group to help those who have trouble letting go (cough, cough). 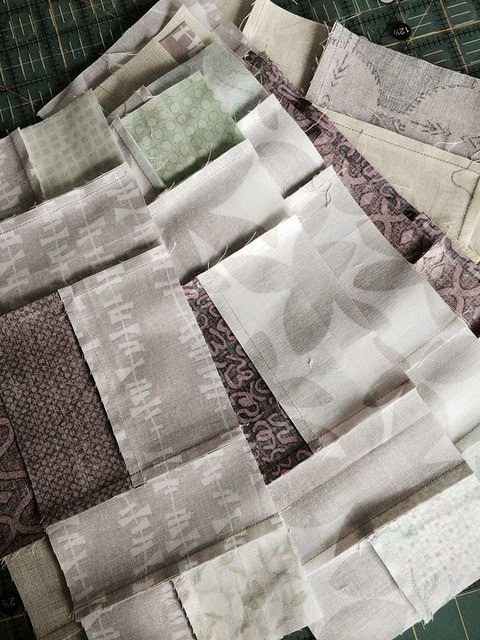 In a couple of weeks I'll be taking a workshop from Mary Tabor called WaterColor Quilt. We get to choose and cut and sew our strips ahead (yeah) and can expect to leave with a top in hand. Because I wanted to make a quilt to give to my co-worker as a retirement gift next month, the timing is just perfect. 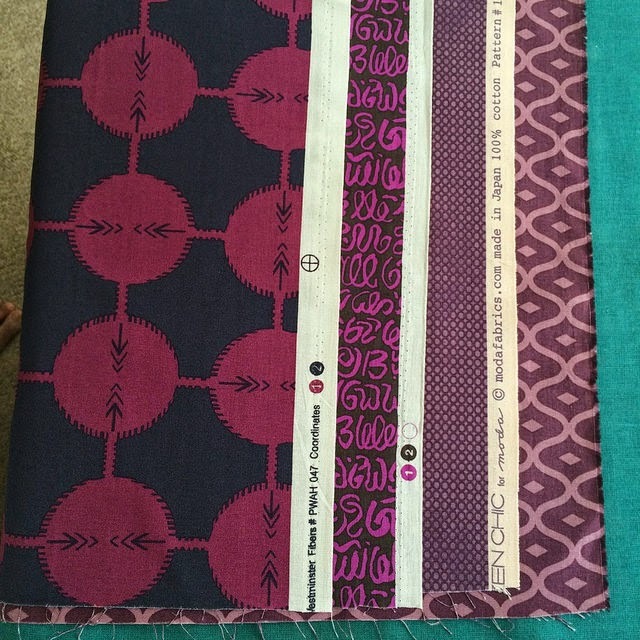 And best of all, because it calls for four fabrics 2 yards each (light, medium, dark florals and a background)- it's going to make a dent in my stash. And second best of all, because they are only 1" once sewn I'm able to use floral prints that aren't necessarily favorites and PURGE. When my hubby walked in the room he asked what the stack was for and I told him about the workshop. His response was "so it's suppose to be fabric that doesn't go together at all?" I laughed and he's kind of right - or at least that's what I'm counting on. I'll share the top in a future post and you can tell me if he was right. 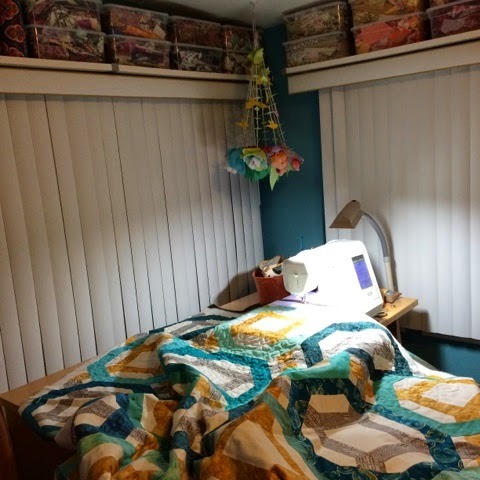 One of the reasons I started blogging was because I was so terrible about keeping track of what, when, why I made quilts. Reflecting back on the creative journey is one way to look forward. Analyzing what choices resonated with you and making a mental note of those gratifying moments can be useful. 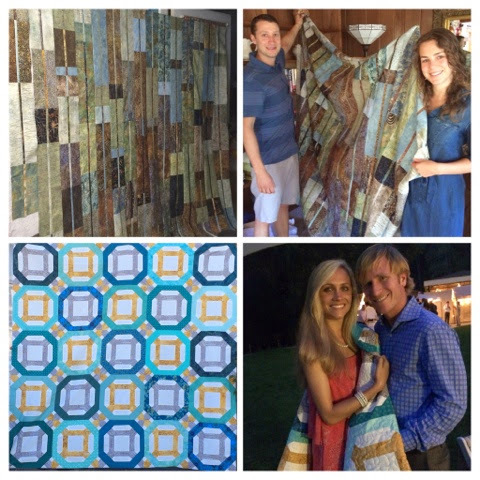 With that in mind, I'm linking up for the first time to Quilty Flashback Friday. My flickr photo info says the picture was taken Oct 2006 and I'm not sure if the camera date setting was correct, but that sounds about right. 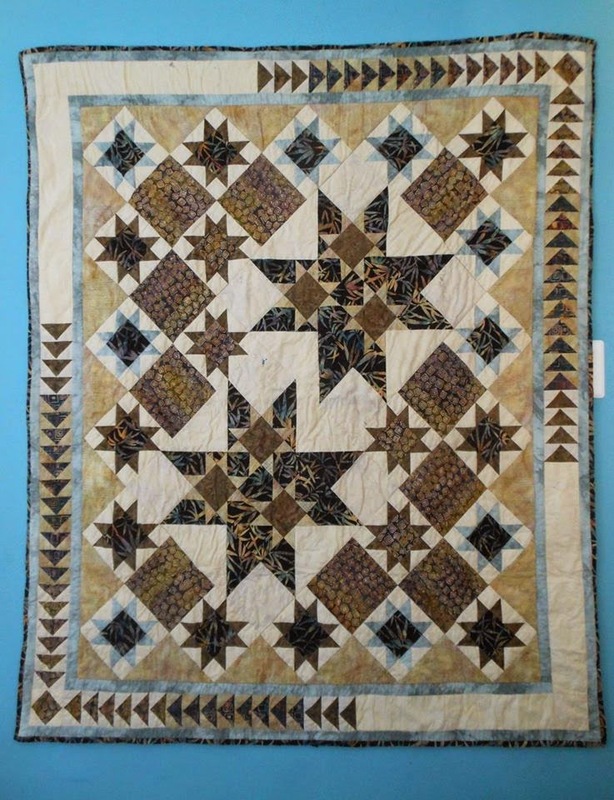 What is significant about this quilt is that at the time, it was outside my comfort zone and I altered the pattern to add the flying geese border. That may seem minor but up until then I'd pretty much made basic repetitive blocks, like rail fence and sewn them traditional grid construction. And I'd repeated patterns that I had already made. 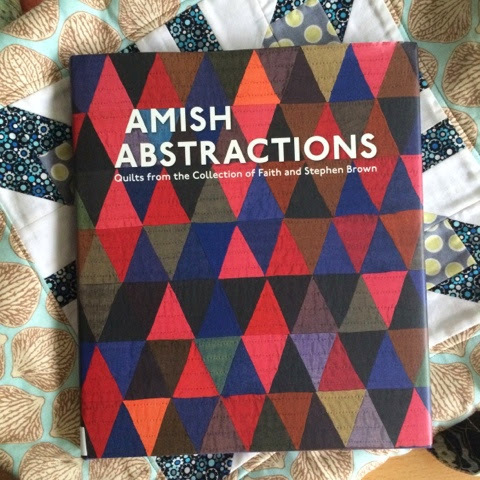 When I asked my son to browse magazines and books for a design he wanted me to us for his quilt, he chose this one with lots of hst, set on point etc.. I was challenged but that was good. It's all a bit blurry but I do recall changing my mind on fabric placement a lot and swapping out choices entirely midstream. Tweaking patterns now (when I even follow them) is pretty much a given for me. I remember feeling very brave to take on a twist and add that border with the varied backgrounds of the flying geese scattered. Here I was thinking that using mixed scale was something new for me, but I guess not! I still like the quilt and actually borrowed it back to take the finished picture shown above because back then, just like now - I'm super terrible about getting that shot before handing off the gift. 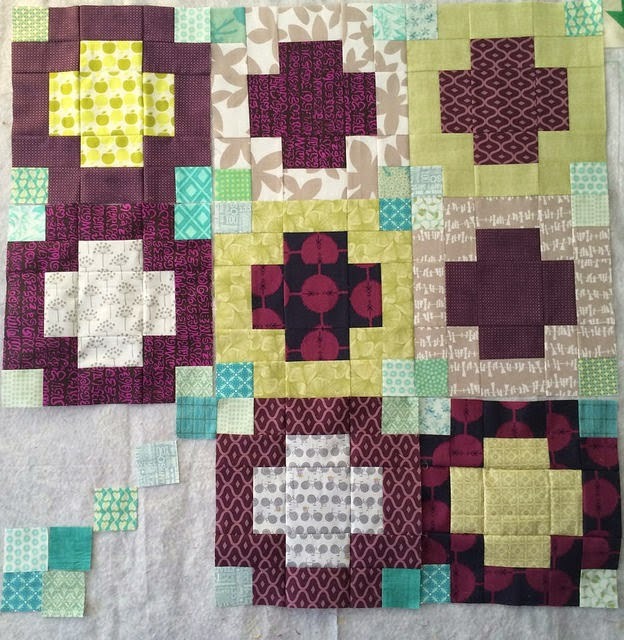 My WIP list has included a June wedding quilt and August wedding quilt for a very long time in anticipation of the marriage of two of my nieces. Long engagements and no excuses, I got really close to making deadline on both. 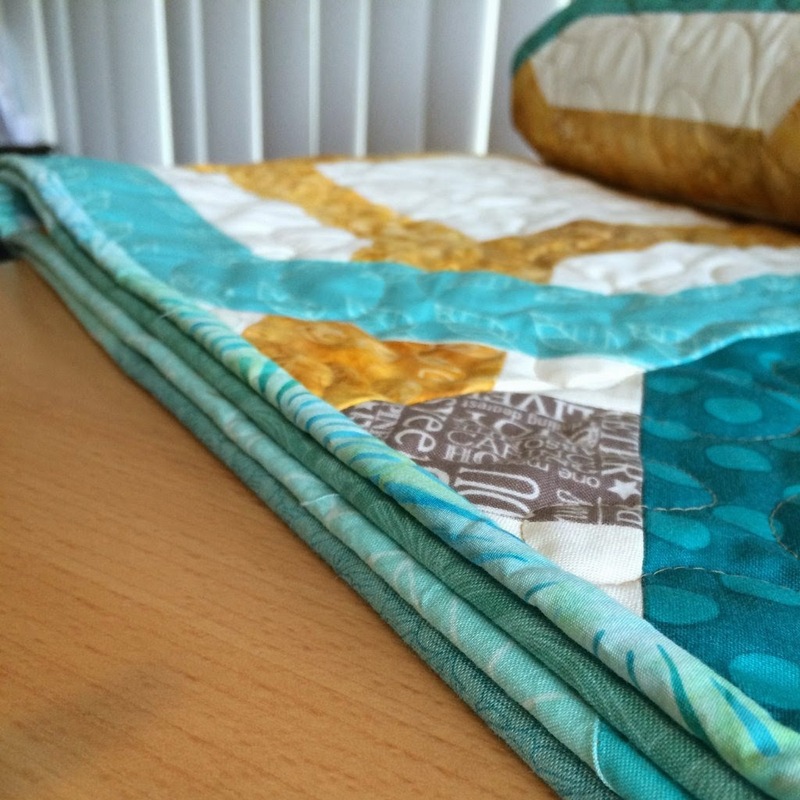 Quite a bit has been shown of Chain+Link (final 2014 FALQ3 GOAL and finish linky party here), a wedding quilt I started at a retreat in March for my niece who was married in June in Hawaii (aqua/teal ocean and golden sunset themed). 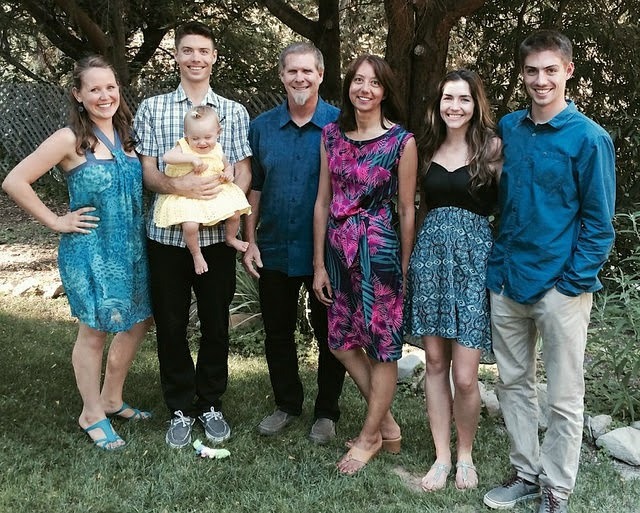 We weren't able to attend but fortunately giving them the gift in person happened weekend before last thanks to a fabulous gathering of family at my other niece's wedding. One done. 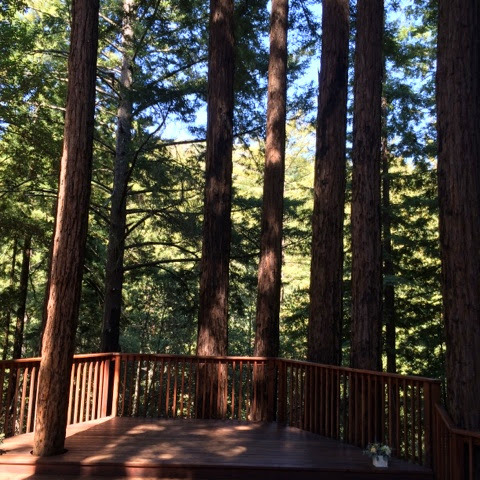 As for my WIP, I'm super excited to finally share the progress of the second wedding quilt that's been in the works, Redwood Grove. The bride-to-be may or may not read my blog on occasion so I didn't want to risk the reveal. 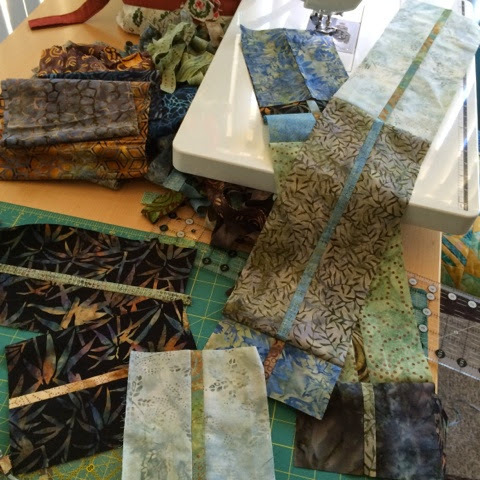 Pairing fabrics - my favorite to do. There was a lot of contemplation when it came to choosing the design for this couple because I wanted it to really capture the natural beauty of the stunning venue where they had chosen to share their vows, and that's a TALL order (pun intended). My SIL helped me narrow the color palette to be sure it would fit in with their home decor. Words like calm, simple and linear came to mind. No surprise I ventured slightly out of the crayon box to make it as scrappy as I could and yet retain a cohesive feel. Mostly low contrast I included pops to represent the way light flickers and casts shadows. I had seen a quilt in a book at my LQS that was similar but with much more structure (cut x amount this size etc..) Using the improv concepts fresh in my mind from the MQG webinar with Cheryl Arkison and the Jacquie Gering workshop, I freely sliced up the arranged to my hearts content. They unwrapped the top, posed for a sweet picture and then handed it back. Ideally it would've been done but that wouldn't be my MO. While they are off enjoying their honeymoon I'll be thinking of them as I finish up. I'm probably going to "add" another 8"-10" to the bottom. Although it's big enough for a queen bed, unlike the other quilt with its circular symmetrical design, square just feels awkward for this one. 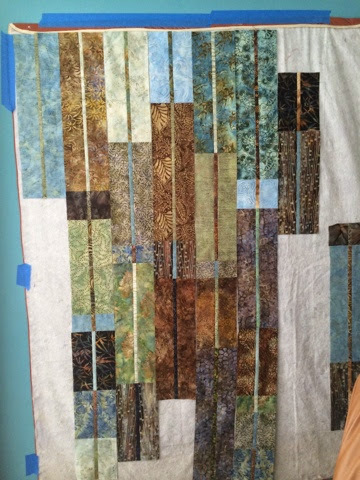 I'm leaning towards doing an organic straight quilting to enhance the tallness of the design. Had to take advantage of being all dressed up and in the same place at the same time with this smily faced group photo - precious times. Now available on Etsy and Craftsy, Rossie has a wonderful blog post about her newly released pattern and the samples she made with Peppered Cotton (want some!) and the adorable vintage sheet stroller sized version as well. Anyone who knows me can attest to that fact that I'm always game for an opinion or two, especially if it comes to quilting. If you ask, you'd better mean it! Since this was my first time to pattern test, I made a point of taking pictures along the way and thought I'd share them. 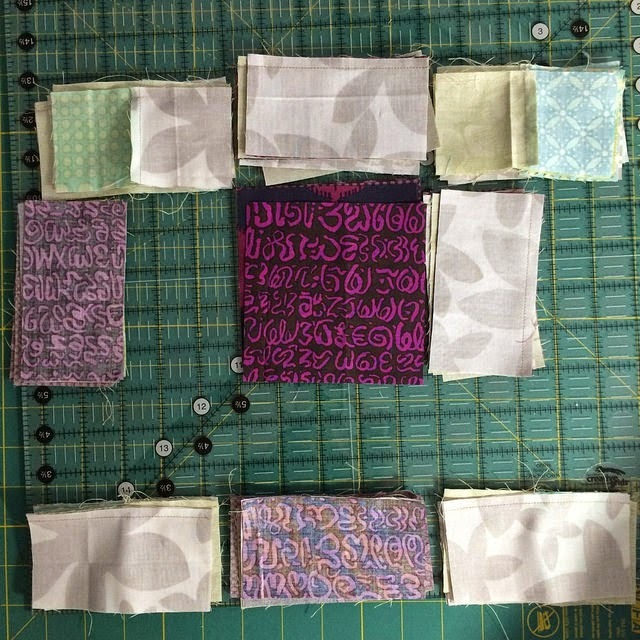 Since I really had no time to do this but wanted to squeeze it in anyway, I decided just to make four blocks and chose some favorite fabric for the focal plus. Usually I tend to avoid directional print but I wanted to put the instructions to the test after all and this added one more element. 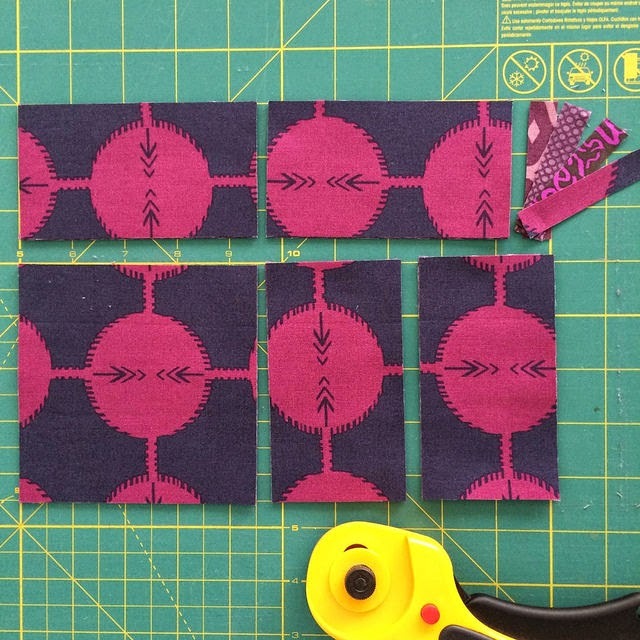 Stacking and cutting layers made it easy and quick. For the plus and background you need a decent sized chunk but for puss it's only a little bit and I wanted them all scrappy so auditioning options gave me some playtime. I wanted them subtle but varied for interest. Once I decided what went were on the design wall, I used my newest 16 1/2" ruler to stack all the parts to keep them in order at the sewing machine. 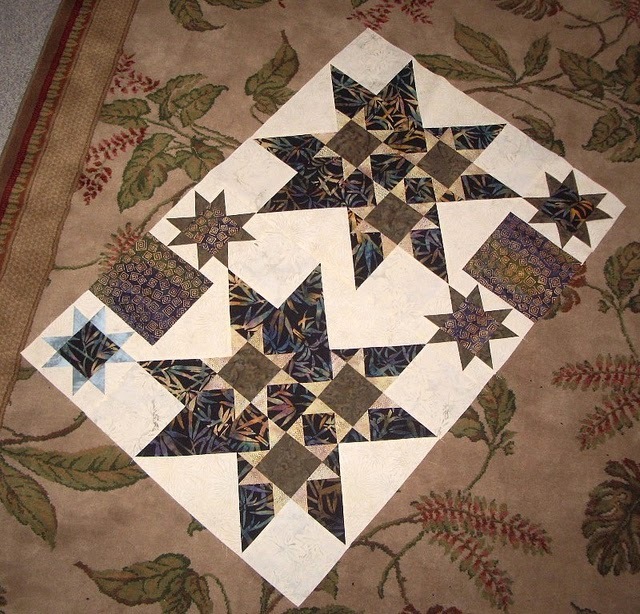 Since the pairing of each block was unique it made chain piecing brainless without worry of mixing up parts. Once the sub-units were joined, returning them to their position with the correct orientation made the process smooth and carefree as well. They look a bit odd spaced out this way but I could check the placement with a quick flip open. Pressing to the side felt a little weird at first. I joined the four blocks and called it done. One of my suggestions was to show mix with the reverse colors and I had that concept stuck in my head. So the next weekend, I snuck in a few hours and expanded to the stroller size quilt with a bit of a twist in the corner to make it my own. 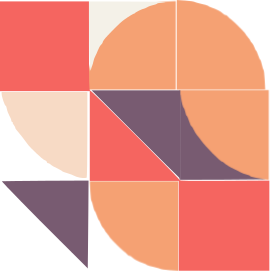 Initially, I thought of repeating the four-patch but opted for a simpler version. 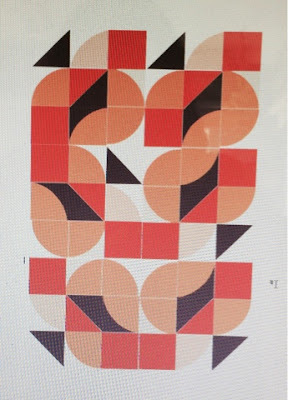 Thanks for coming along on my first Pattern Testing journey - I'm excited to be taking a class at QuiltCon with Rossie and meeting her in person. 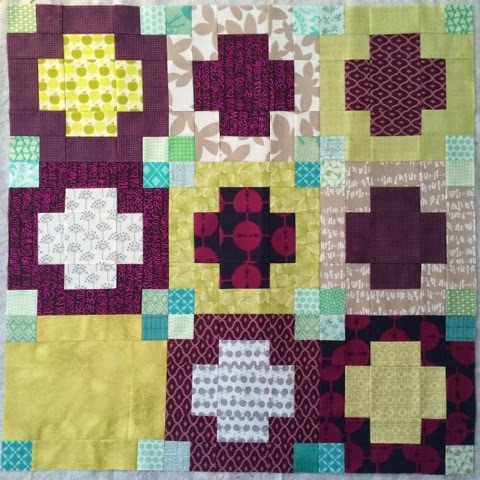 Lucky me - I won the newly released Block Flower pattern from Jess at Elven Garden Quilts . If you don't already follow her blog be sure to check it out. 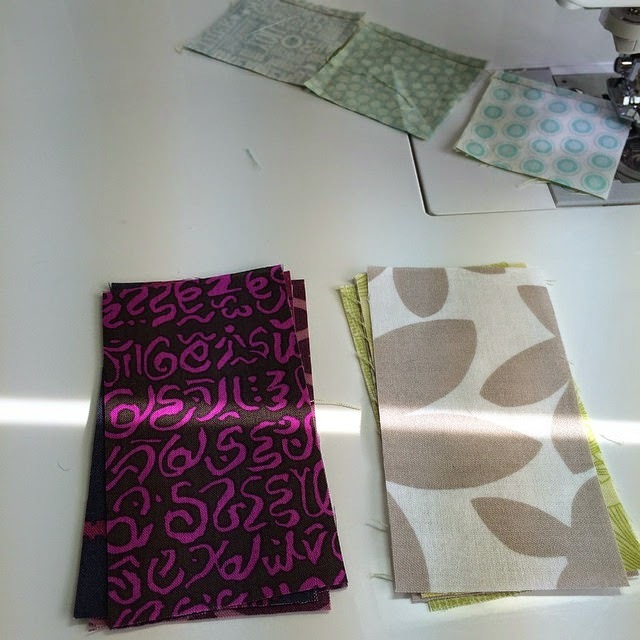 There is a tab for her current series Decipher Your Quilt and Free Motion QAL. 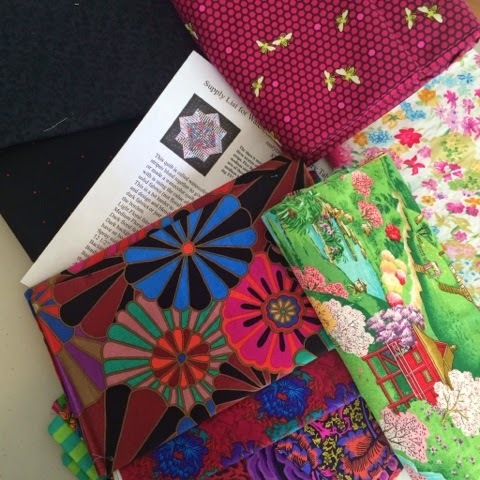 I also enjoy looking back at the previous Color Theory for Quilters information because the information really is timeless.